While starting as a "traditional" telling of this story, Titus: Sweet Water, Silent Walks evolved into a silent telling of the story to bring light that victims often feel like they don't have anyone to turn to and don't have a voice. This BAND Group production took Shakespeare's Titus Andronicus, a play usually focused on the repercussions of revenge and violence, and moved the focus to Titus' daughter, Lavinia, and the violent sexual assault that leaves her without a way to communicate. 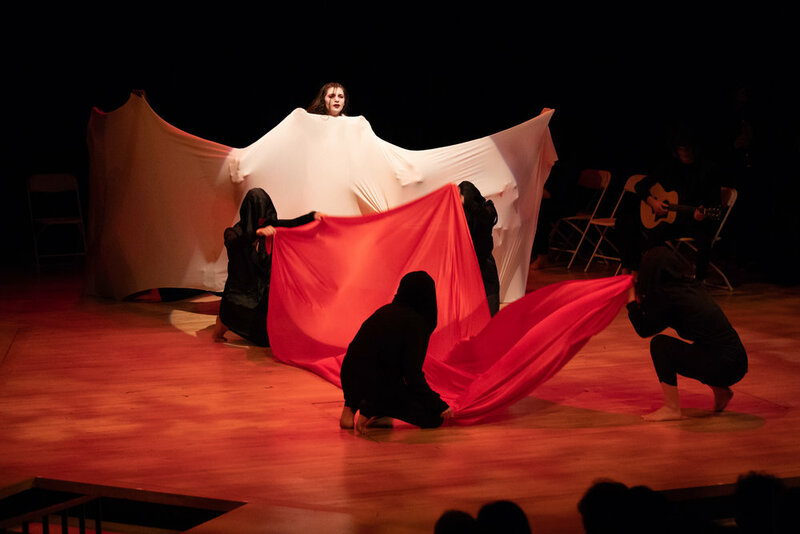 Adapter Adrian Lopez-Balbontin worked with Shakespeare’s original text to amplify the story through Lavinia’s lens and in collaboration with choreographer Jackie O’Neil created a one-hour physical theater piece. The cast for this production featured an ensemble of eighteen including Julia Amundson (Chorus), Chloé Bell (Marcus Andronicus), Patrick Kloeckner-Walters (Mutius Andronicus), Troy Lowry Jr. (Quintus Andronicus), Jolie Meshbesher (Tamora), Alex Moronge (Aaron), Ben Murphy (Chiron), Kelly Nelson (Marcus Andronicus), Todd O’Dowd (Saturninus), Jackie O’Neil (Lavinia), Shae Palic (Titus Andronicus), Beth Ann Powers (Young Lucius), Matt Saxe (Martius Andronicus), Olivia Schierbeck-June (Chorus), Anna Marie Schmidt (Chorus), Johnny Stang (Bassianus), Ben Swenson-Klatt (Demetrius), and Kjer Whiting (Lucius Andronicus). TITUS: Sweet Water, Silent Walks was directed by Adrian Lopez-Balbontin and Jackie O’Neil with costume design by Chelsey Hanvy and stage managed by Kaitlyn Larsen. This Production ran August 2 through August 18, 2018 at the University of Minnesota Rarig Thrust Theater during the Minnesota Fringe Festival.